Wacken Winter Nights is not a small Wacken Open Air taking place in Winter. It is very much a concept of its own! Wacken Winter Nights combines classical medieval themes with fantasy, folk, pagan, viking, rock, metal and much much more! Immerse into a long forgotten age and experience different magical theme worlds with their very own stages. Enjoy intimate concerts by warming campfires. At the ICE PALACE, the main stage you will see amazing performances of bands from such genres as medieval rock, symphonic, pagan, viking, mystic folk and more! Venture through a historical medieval market and visit it’s very own OLD VILLAGE CHAPEL with it’s very own musical artists, fires hows, magicians and more. Inside of the THEATRE OF GRACE which is the second biggest stage you will experience even more amazing concerts. Discover the MYSTIC WOODS an enchanted forest where you will meet jugglers, bards, magicians and other mythical creatures. Further you can visit the local VILLAGE CHURCH for special selected acoustic shows!! Furthermore you can take part in several workshops, see craftsmen displaying their skills or bargain for goods at the market. Enjoy the gastronomically top class medieval treats, many of them in organic quality. Apocalypse Orchestra, Arkona, Bannkreis, Eluveitie, Ereb Altor, GrAimner, Harpyie, Heilung, Korpiklaani, Moonsorrow, Saltatio Mortis, Skiltron, The Dread Crew of Oddwood, Trollfaust with many more to come! And keep up to date. Dedicated Reserved Seat (deck 7) Enjoy the comfort of a Reserved Seat giving you a dedicated place to relax onboard. For added comfort, you can purchase a sleep pack with blanket, pillow, eye mask, ear plugs and a shower pack with soap and shampoo gel plus disposable towel. Wines, spirits and tobacco are sold in our onboard shops at French prices, which means they cannot be purchased within UK territorial waters – the shops may open for browsing, and sales of other goods closer to the UK, but we are not allowed to sell passengers alcohol and tobacco within 20 minutes of the UK port. The purchase of alcoholic beverages is prohibited to persons under 18. Purchases made on board may be paid for in Euros or Sterling. Payment can be made in cash, by credit or debit card. Prices are shown in both currencies and you can combine different payment methods. Free Wi-Fi internet access On board Wi-Fi Internet access is now provided free of charge to passengers. You need to log-on to the Internet@Sea network, using the access details provided on your boarding card or cabin key. You can access the Internet on deck 8 in the self service restaurant ‘La Galerie’ and the cafe/restaurant ‘Comptoir des Saveurs’ also on deck 9 in the cafe and bar where you see the Wi-Fi logo. For more information please visit our Wi-Fi page or enquire at the information desk on board. Dual currency ATM: We no longer provide a Bureau de Change. However, we offer a dual currency ATM, which dispenses both £ and €. 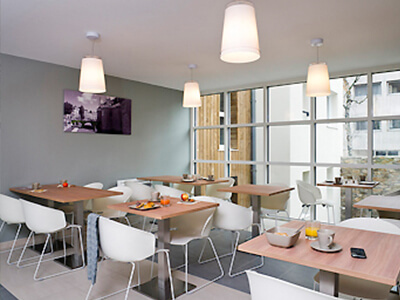 La Galerie is Mont St Michel’s self-service restaurant. Situated on deck 8, diners here can enjoy a large dining area. Le Café du Festival Serving sandwiches, cakes, pastries and hot and cold drinks, Le Café du Festival, not only offers a delicious choice of snacks, it’s also a great place to relax and enjoy time with your fellow passengers. Blue Note Bar The only bar on Mont St Michel, Blue Note, is situated in the centre of the ship and serves everything from our finest French wines to cocktails. Also on the menu are hot and cold drinks and snacks. 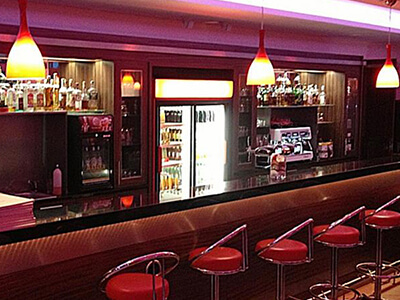 The bar offers passengers a large, open space with plenty of seating as well as a number of comfortable sofas and quieter areas near the windows on either side of the ship. 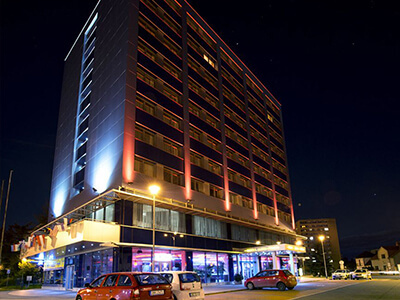 We are delighted to be able to include the impressive 4 Star Holiday Inn as part of your package. Relax in your inviting Guest room with Complimentary WIFI, Cable / Satellite TV, In Room Movies (Pay Per View), Work Desk w/ Lamp, Direct Dial Phone, Ensuite bathroom including Bathtub, Hairdryer, safe, Coffee/Tea Maker, Mini Bar. Room Service is also available. 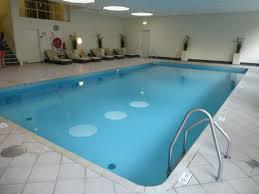 The hotel has an air-conditioned gym and heated indoor swimming pool. 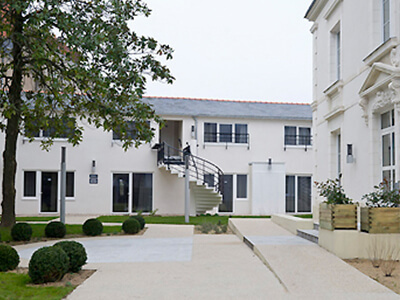 Why not work up an appetite and dine in the hotel’s own little piece of Paris, Brasserie FLO, a classic French brasserie or just enjoy a drink in “The Living” Bar, with its warm and attractive ambiance with soft seats and a cozy open fireplace. 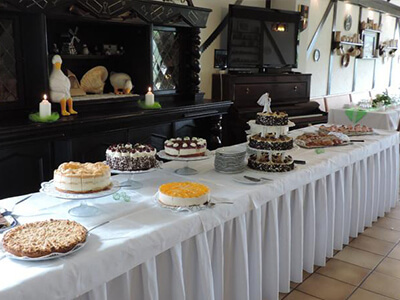 A delightful buffet breakfast is included in your package. Back to what was to many of our clients, the most vibrant of all the destinations we visited, the City boasts the longest pub street in the Netherlands with over 50 bars and clubs. Stratumseind attracts a young crowd that’s up for anything. You can find anything from Metal, to salsa to rock and roll, a lot of dance & techno, and party music. Thursday, Friday and Saturday nights turn this street into a party that lasts until 4:00 AM. Walking up and down the street looking for the perfect spot is half the fun, explore the different bars and clubs and you will not be disappointed. Eindhoven basically has everything that Amsterdam has to offer, but in a fraction of the space. What’s more everything one needs is within crawling distance of our hotel. USA Rockers Anthrax are set to headline this year’s Event but in fact the Festival is “actually playing five headliners,” says organizer Sander Waterschoot. Anthrax, At The Gates, Audrey Horne, Life Of Agony, Metal Church, Powerwolf, Sacred Reich. Everybody has a voice…anybody can question the quality of any of our products, and the standard is very simple: Put yourself in the position of the consumer, and if you wouldn’t be happy with what you’re going to give them, don’t give it to them. We choose to be different from those organisations who grow to such a size where many levels of management dilute personal responsibility. We like to be small, but at every level of our work you will find someone who is responsible, who knows their work and accepts their responsibility to exercise initiative and judgment and to make decisions as required. You help your customer, by producing the product the customer wants. Your customer helps you, by buying your product. Our strength lies in our efficiency, the ability to organize and the attention to detail. Through efficiency, our goal is always to ensure that our products and services are offered and delivered with convenience, enjoyment and safety to our customers and with the highest quality, at the least possible cost without sacrificing standards. We need freedom to shape our future; we need profit to remain free. It means we don’t have to borrow to fuel our Business; our Products and Services to our customers. Our freedom ensures there is a Company in Argon Events that may invest in its future, a Company that exists to serve those that would direct it. 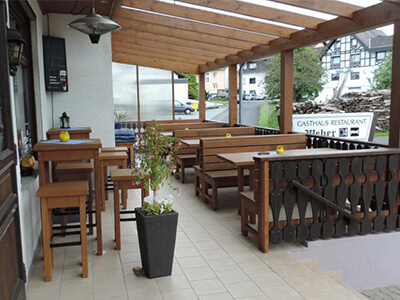 For this year’s festival as usual we have booked the hotel Gasthause Weber. 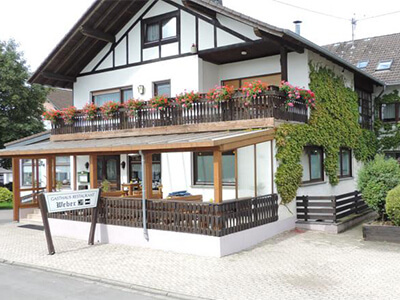 The family run hotel is located in a small village close to the Nurburgring. Journey time to the festival site, 5 minutes by coach, 20-25minutes on foot. All rooms are fully ensuite with shower & WC, plus TV and radio. The hotel has a bar that tends to stay open as long as you’re in it, and a nice restaurant. 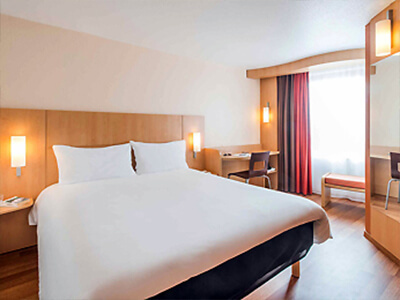 For this year’s Festival we are delighted to be able to announce that we have once again secured rooms in the Hotel Ibis Nantes Centre Tour Bretagne, looking down over the City of Nantes. The hotel is a five minute taxi ride from the railway station (10 minute tram ride). Being close to the City centre, there is of course no shortage of shops, bars and restaurants within walking distance. 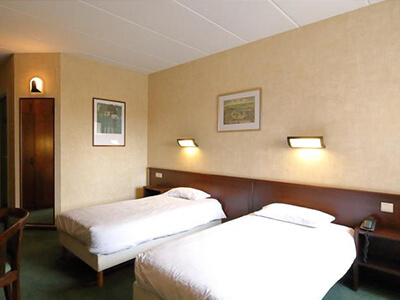 All rooms are air conditioned and fully en-suite with satellite TV, telephone and free Wi Fi. 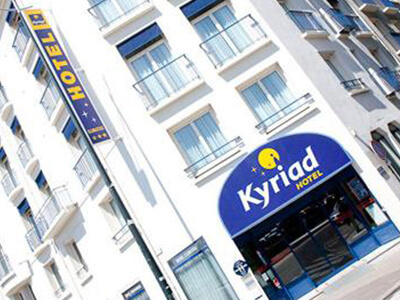 Formerly the Hotel Kyriad, The Hotel Ibis Styles Nantes Centre Gare is located opposite the north entrance of the main Gare du Nord station in Nantes and is absolutely ideal for people arriving on our Eurostar Package from London. Being by the station means that the hotel is less than a stones throw (more a lob) from the City’s shops, restaurants and bars. 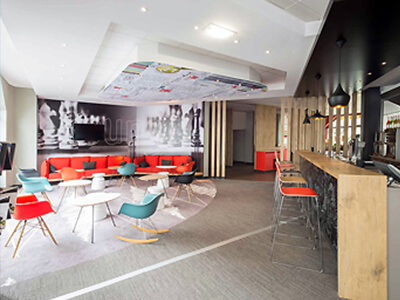 The hotel offers soundproofed rooms with air-conditioning, plus Canal +, Satellite Television and Pay TV, mini-bar, telephone, computer socket, wireless internet access, trouser press, and hospitality tray (hot drinks and cakes provided). The en-suite bathrooms have bath/shower,or power shower and hair-dryer. 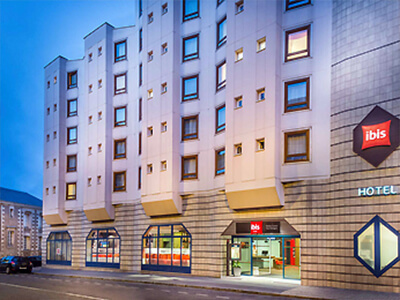 Situated just 300 metres from the Ibis Hotel (above) on rue Russell, are the Adagio Access Apartments Viarme. At this establishment we have a number of 1-2 person studios for double or single use (no twins available). These delightful one room facilities feature a sofa bed (to create room), en-suite WC with bathtub or shower, work station, flat screen TV, high speed internet connection and fully equipped kitchenette with microwave. As with all our accommodation, breakfast is included, but please note that this is not strictly speaking a hotel, more a self catering facility. Therefore, whilst bed linen and towels are provided at the outset, these are not changed during your stay and there is no daily maid service (hooray, no knock on your door at stupid o’clock!!). The information below has been selected directly from the official Hellfest site. It contains answers to many of the questions you might like to ask about the Festival. For more info please go directly to the festival website. Campsite is free and right next to the festival! The campsite doors open Thursday at 2pm upon presentation of your ticket. You will then be given your bracelet for the festival so all you’ll have to do is set up your tent! ATTENTION !!! This campsite is only for those holding a 1 or 3 day pass. When you arrive volunteers will give you a “camping bag” with goodies but its main use is as a bin bag and a you’ll be given a token for every bin bag handed in. We rely on you to keep the site clean. A toilet block will also be available. Will there be a help-desk (open day and night) ? The help-desk will be in the festival area. However, you will find people of the Hellfest crew or security agents who can help you 24/24 at the camping. Can I bring my own food and drinks without any restrictions (alcohol, quantity,…) ? When and where can I get food and drinks within the campsite ? There are bars and stalls inside the Metal Corner (area dedicated to partying and catering). Does the camping have an all-night illumination system ? Do I have free and easy access to drinkable/non drinkable water ? The water points aren’t free at the camping. You should buy a “water point” bracelet (€6) which gives an unlimited access to showers and water points. Inside the concert area, the “water points” are free. Can I use a stove or a barbecue grill ? No, you can’t : the use of anything related to fire and inflammable liquids is not allowed. Is there a waste collecting/recycling system ? Yes. Like the previous years, it will be run by an association called Uri Green. Are there free bin bags available ? Free bin bags are given to you when you enter the site. Once your bag is full, you just have to throw it into a container and ask for a new one to the Uri Green crew. Is there a rewarding system if I do a good job collecting waste ? You’ll receive a free token for every 50 caps collected and given at the Uri Green stalls. People under 18 years old must be accompanied by an adult ! Can I get into the concert arena with my own food ? Yes, but tins or glass containers are strictly forbidden. Can I get into the concert arena with my own drinks ? What means of payment are available to purchase drink tokens ? Can I buy food with my tokens too ? No – tokens are only dedicated to drinks. Can I have my money back if I have not spent all of my tokens ? Can I use last year’s tokens ? Will there be vegetarian food stalls ? Yes, you’ll find a vegetarian food stalls at Hellfest this year ! Will there be an area dedicated to catering (with chairs, tables, shade.. ) ? Do you have to own a Hellfest plastic cup so to as to get drinks inside the concert arena ? How do I buy my plastic cup, then ? When you order your first drink, you’ll be charged one token (=one euro) more and you’ll be given your cup. Can I give my plastic cup back so as to get my money back ? Is there a ‘Lost and Found’ helpdesk ? Yes. It is located nearby the entrance, inside the concert arena. Both free and not free earplugs will be available within the concert arena. Can I find cash dispensers in the festival site ? Yes ! As last year, there would be cash dispensers on site. Also you could find some in downtown Clisson as well as at the supermarkets neaby the festival. Can I buy basic products in the festival site (soap, biscuits,…) ? No, but you’ll find everything you need in downtown Clisson. Can I buy cigarettes in the festival site ? No : that’s against the French law. Once again, you’ll have to go to downtown Clisson. Are there lockers available for valuable belongings ? Yes ! Finally, we will have lockers to rent this year ! Are there desks so as to reload mobile phones ? Yes, you could reload your mobile phone at the “Point Info” office. Are there wi-fi access facilities ? What kind of equipment can I get into the concert arena ? Yes, you can bring your camera (including SLR cameras) with you, video cameras however are not. If a band decided to disallow it, the use of photo camera will be banned for the entire day. Please note that there was not ban since 2008. Are signing sessions organized ? Yes. There will be a dedicated area inside the concert arena. How do I get information about these signing sessions ? Information will be posted there regularly. Will there be shuttles to travel from Nantes to Clisson or in Clisson ? – €2 for a trip in Clisson. 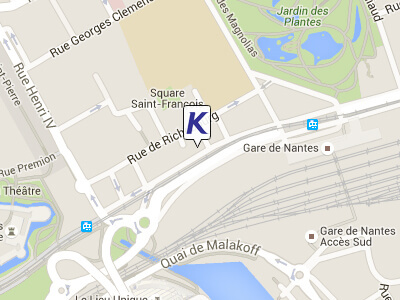 – €10 (if you’re at least 5 travelers) until 8pm for a trip from Nantes to Clisson or Clisson to Nantes. Are there special facilities (dedicated car parks, campsite spot, toilets, showers, concert spots) for people with a handicap ? Yes ! And this year a special team will be there to help you. 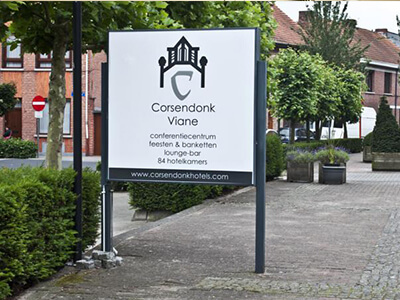 Our hotel for Graspop Metal Meeting is the ever popular Corsendonk Vianne Hotel in Turnhout. Located with good shopping in the immediate vicinity. Transfer time to the festival site is approx 20-25 minutes. A hearty buffet breakfast is included in your package. The information below has been selected directly from the official Graspop Metal Meeting site. It contains answers to many of the questions you might like to ask about the Festival. For more info please go directly to the festival website. Lodged in between the festival arena and the campsite there is a large 24h ZONE with booze tents, toilet blocks, an info stand, token stands, police post; a restaurant and lots of side animation. And when the guitar violence has died down, the Metaldome will host the after party till the break of dawn. The 24h zone is open around the clock (or just-about anyway). The 24h zone is closed between 5 and 7 am to get things ready for the rest of the festival day. The festival site opens its doors every day on 10am en closes after the last performance. Across the entire festival grounds you will find food stands offering French fries, pastas, pizza, Mexican food, pita, waffles, ice cream, sandwiches, fruit, etc. There’s something to suit all tastes! All you vegetarians out there have not been forgotten. There are stands with fruit, vegetarian pastas, noodles with vegetables, etc. The bars are located in the centre of the festival grounds so you never have to walk very far if you want a drink. Graspop Metal Meeting wouldn’t be a genuine Belgian festival without our traditional Belgian beer! 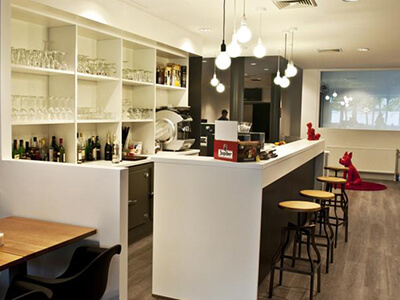 The BELGIAN BEER CAFE,in the 24h zone, is open for business throughout the festival. Graspop Metal Meeting supports the ‘Respect16‘ campaign of the Belgian Brewers. Food and drinks are paid with GMM tokens. A GMM token pays for soft drinks, cold beers, French fries, pizza, pasta… in short, everything that qualifies as food and drink. One Graspop token will cost 2.25 euros in the festival arena. Graspop tokens are available from the token stands in both the festival arena and the 24h zone. You will also be able to buy the tokens from vending machines, so the choice is yours. Graspop tokens are also available in pre-sale. You can buy the so-called BOOZEBAGS. On the festival grounds and the campsite a special collection point will be installed for the recycling of empty drink cups. Collect 24 cups and get a free drink token or… collect 50 drink cups and make your choice from a collection of fun gadgets. You’ll be helping to keep the festival site clean while enjoying a free beer! The toilet facilities are non-paying and are scattered across the festival grounds. Please respect our toilet facilities and keep them clean. There are also accessible toilets for wheelchair users. Urinating is only allowed in the designated toilet areas. The water from the wash basins at the festival grounds is drinkable! There’s a cash dispenser in the centre of Dessel. Nevertheless, it’s a good idea to simply bring enough cash for the entire weekend. Graspop Metal Meeting continues to improve the quality of the festival for the visitors. Also this year, we are providing optimal protection, so that you can keep your possessions under lock and key for one day, or for the entire duration of the festival. More info to follow! Looking for information on the train schedule, the shuttle service, the line-up, the emergency services…? The info team will assist you to the best of their ability! If you’ve lost something (or perhaps even someone), report it to the info desk! All items in the lost and found bag are taken to the police post at the end of each festival day. Theft, material damage, loss of property … report it to the police post at the 24h-zone. When you enter the festival grounds you may be searched. If you refuse, you will not be allowed to enter. TV recordings will be made during the festival. There is every chance that you will be filmed. Things that are not welcome include: drinks and food, tin, plastic and glass containers, sticks, pointed objects or other potentially dangerous objects sharp objects, film/audio/photo cameras, drugs, folding chairs, flagpoles, parasols, non-retractable umbrella’s with pins. Pets are not allowed; it goes without saying that guide dogs for the visually impaired are allowed on the festival site. On and around the festival ground (this means on campsites and the public road as well) it is strictly forbidden to hand out flyers or any other type of promotional material. For other festivals, we have foreseen big bill boards all over the festival ground. Small cameras for the purpos of taking pictures, sandwiches, retractable umbrellas without pin (no parasols), plastic and blankets to sit or lie on, sun lotion and small backpack. 3 large bathing house consisting of toilets, showers and washbasins. A shower costs 1 Graspop token. The water from the wash basins campsite is drinkable! There’s also a adapted toilet and shower. You’ll find a Festival Express Shop on the camping grounds. 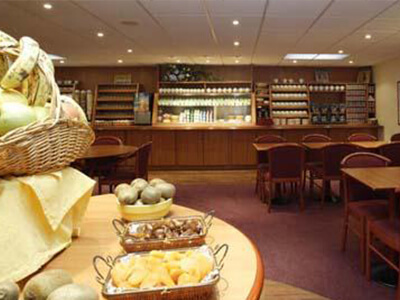 The shop sells food, care products, camping supplies, cold drinks, … at supermarket prices! In short, anything you forgot to bring you can buy here! Festival-goers who refuse to respect the rules and who endanger the safety of others will be removed from the festival grounds without delay and will be banned for the remainder of the festival. Glass, campfires, torches, candles, fireworks, fire spitting, large barbecues with gas cylinders, fuel powered devices (petrol, petroleum, oil, gas, etc. ), weapons and dangerous objects, spirits, drugs, pets, party tents, power supplies, power generators, sound equipment and beer dispensing equipment, wheel barrows, shopping carts. Commercial activities and handing out flyers or any other promotional material is strictly forbidden. Small barbecues* and camping gas* (blue canisters) for single use, cans, beer and softdrinks (max. 24 cans of 33cl per person, or equivalent), guide dogs for the visually impaired, sunshades. *In case of extreme heat, this equipment is not allowed. Thanks for your understanding. It is illegal to bring gas canisters on to the coach, these can be purchased in Dessel or at the Camp shop. 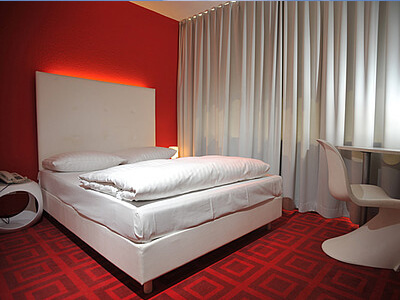 We are delighted to be able to offer you the fabulous 3 star Hotel Alessandria for your stay. TV with satellite and direct-dial telephone. A choice of daily transfers will connect you to the festival site. Transfer time to the site is approx 20-25 minutes. A buffet breakfast is included in your package. 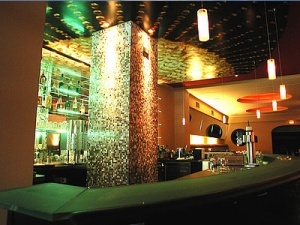 The hotel also has a restaurant and bar amongst other facilities. Welcome inside of the Old army fortress in Josefov near Jaromer (approx. 130km east of Prague)! The festival itself will happen directly inside of the 18th century fortress that has its very unique atmosphere and history and makes Brutal Assault festival a very special one. The festival takes place in the old fortress, both stages are situated on a main square. Surrounding streets are used for additional services including more than 30 food kiosks. Carnivores, vegetarians, vegans – we will feed everybody! There are also 4 big beer stands and even some more places where fine Czech beer is served. Five beer brands will be served this year as well as various shots, drinks, lemonades etc. We will keep the two-scenes model that will be placed next to each other and the live production will run continuously (so they won’t play at the same time but once a band on scene one finishes, another band on scene two will start within a few minutes). Do not forget to check out the “Natural stand” with a unique front view on both scenes from an 8 m high walls. Really impressive views, especially after dark. A natural uphill, partially offering seating capacities. You can also use our “walking beer” service or delivered beer. Whenever you find the music noise too loud, there is nothing better than visit our chill out zine called „Green meadow“. Only a 3 minute walk from the noisy environment and you are in a quite place where you can relax and get ready for the next attack on your ears. The “Green meadow” offers besides chill out also a monster “Metal Market” with more than 50 stalls and also a “Horror Cinema house”, where you can watch the most bloody horrors of the film history all day long. The “Meet and Greet” stand is one of the most popular places on the “Green meadow” where you can get your heroes signed anywhere you can only think (including boots:-)), take a picture with band members or just to shake a hand with the artists. The festival camp site is situated on a grassy meadow about 300 m downhill of the main festival gate. The “VIP Camp” offers a non-stop guarded camping. Other services are also included: tiolettes, depository, the “Natural stand” 3-day free pass, one-time shower coupon etc. No parking is allowed on the camp site due to the capacity reasons. Please use the designed parking places in the Josefov’s streets orguarded parking situated close to the camp site entrance. 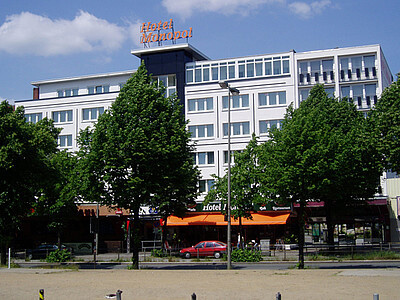 As usual we have managed to secure the popular City Hotel Monopol, our base from the very first trip back in 1999, in the very heart of the world famous Reeperbahn. 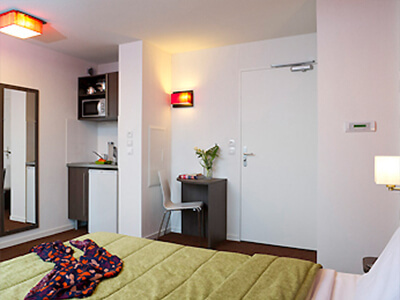 All rooms are equipped with bath/shower/toilet, a make-up/shaving mirror, CableTV/Radio with remote control. A modern telefonstation with plugins for internet connection with your laptop computer. The information below has been selected directly from the official Wacken site and somewhat condensed for your convenience. It contains answers to many of the questions you might like to ask about the Festival. For the full version please go directly to the festival website. In order to access the Wacken campsite you must have a valid 3 day ticket. This is exchanged for a wristband on entry, enabling you to leave and return to both campsite and festival site for the duration of the Festival. Each area within the campsite is numbered and has its own checkpoint with drinks & food, toilets, showers, a supermarket, information checkpoint and water. You can bring food and drink to the camping area including canned beer but please do not take glass bottles. Normal photo cameras or digital cameras are allowed on the festival area. Video cameras are prohibited! For safety reasons you are only allowed to bring Tetrapaks with non-alcoholic substances to the festival area. Each person is allowed to bring one 1,5 l TetraPak. Before entering the festival area, bags will be checked for any kind of weapons, sharp objects in general, video cameras and boxes and other containers, which are not allowed (e.g. perfume bottles, cans, and bottles in general). These properties will be confiscated. Neither cans nor bottles are allowed in the festival area. Chains (bicycle or motorbike chains etc.- Attention: wallet chains are allowed!) Projectile belts are not allowed! Any kind of pyrotechnical goods. These are also not allowed on the camping ground!!! Just like in the rest of Germany at any time except New Years Eve! Offenders will be ejected from the festival and camping ground. There are booths spread all over the festival & camping area, where you can get real beer and whiskey (e.g. Becks, Becks Gold) for realistic prices. You can also find the W:O:A beer garden (Biergarten) on the festival area. All the drinks you buy on the Festival will be given to you in our W:O:A beakers (0,4 l. & 0,3l. pledge/piece 1€). 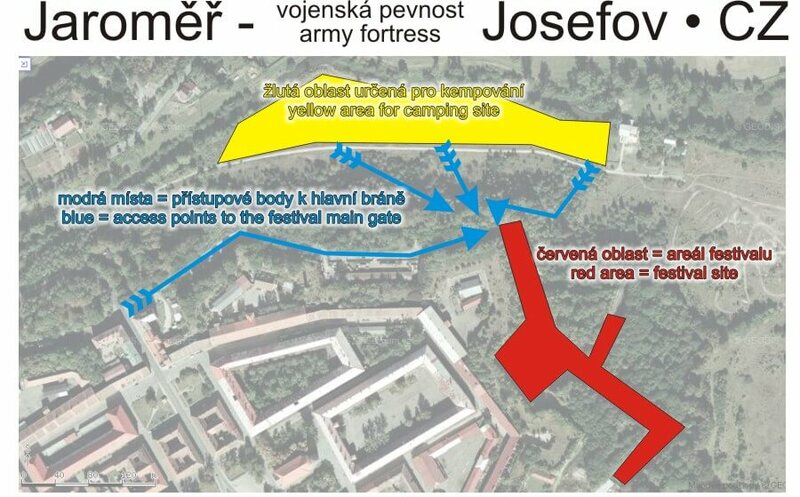 There are five big checkpoints (Shower camp) with showers, lavatories and clean flush lavatories (2,50€ for using). Just like last year, you can get original W:O:A towels and bath sheets, which you can buy at these lavatory checkpoints and at one of the merchandise booths. An information checkpoint and a supermarket are arranged at each shower camp. Super-Market, you can get the following goods at the W:O:A supermarkets: Fresh bread rolls and a festival newspaper, cigarettes, American Spirit, margarine, soluble coffee, marmalade, Nutella, orange juice, different kinds of pretzel sticks, sausages, marble cake, muffins, Haribo Colorado and Gummi Bears, mustard, ketchup, cacao, long life milk with 1,5% fat, Maggi ravioli, pea soup, green bean hotpot, sandwiches, coffee, cream for the coffee, toast, mineral water- 1,5 l with sparkling, mineral water- 1,5 l without sparkling, ice tea, disposable coca cola 1,5l, Energy drinks, Becks can sixpack, ice cubes, crushed- ice, Wacken beer, shots of Feigling, Jägermeister and Dirty Harry, Jägermeister, Oldesloer Korn, Wodka Gorbatschow, at a reduced rate Vodka, Jack Daniels 0,7 l, Sangria 1 l, Ballantines, Strongbow Cidre 0,33 l, Met, campingarticles, condoms, shampoo, suntan lotion, sanitary towels, tampons, disposable shaver, tooth brushes, tooth paste, earplugs, toilet paper double- ply, lighter, batteries (baby, mono, AA, AAA), flash lights, gas for a camping stove, disposable grill, coal briquettes for a grill, beakers, knives, forks and spoons made out of plastic, disposable plates, meat for the grill, bratwurst, cold meat and cheese. Clean flush lavatories are available in the shower camps (0,50€ including the ability to use the group sink) and on the festival area, as well as the SANI- toilets on the whole area (for free). Special Lady- Toilets are located on the festival area and are also free of cost. Mobile toilets are arranged all over the camping area. The office in Wacken is where you can get all the information about Wacken. If you have any questions the staff are there to help you. They can help you with lost properties, telephone/fax, running order, ground maps, Meet & Greet, first aid and many more things. You can also recharge your mobile phones there (bring your charger!). This is a supplement to the Info-office at the ribbon container. Wacken Phone: +49 (0) 4827 998 599. The meeting point is located directly at the ribbon container on the new event area. Pharmacy Emergency Service, if you need something from the pharmacy, please contact the emergency service of the Duhorn Pharmacy in Wacken (http://www.duhorn-apotheke.de). Monday – Friday: 08.00 a.m.- 08.00 p.m.
Saturday 08.00 a.m.- 06.00 p.m. Whenever you have questions, the police will help you. Don’t panic, they are easy going and cooperative. The police checkpoint is located at the main entrance to the festival area. You can find four cashpoints at the festival fore court near the beer garden and one at the W:O:A office, plus two in the centre of Wacken. The neighbour villages Holstenniendorf, Vaale and Scheenefeld have got cash points as well. Exchange / Bank / Cashpoint, to keep you from long walks to one of the banks in Wacken, we give you the opportunity to get your money right at the festival area. Once again we have installed several cash points, which were allocated from the local Sparkassen. Four of them are located on the forecourt of the festival area near the beer garden (Biergarten) and one near the W:O:A Information Office. First aid, you can find First aid at the DRK- booth (Deutsches Rotes Kreuz- German Red Cross) next to the main entrance of the festival area. Please keep the emergency exits for the DRK free! We will install Info- Boards at different places on the W:O:A area, so you can find your way on the grounds. 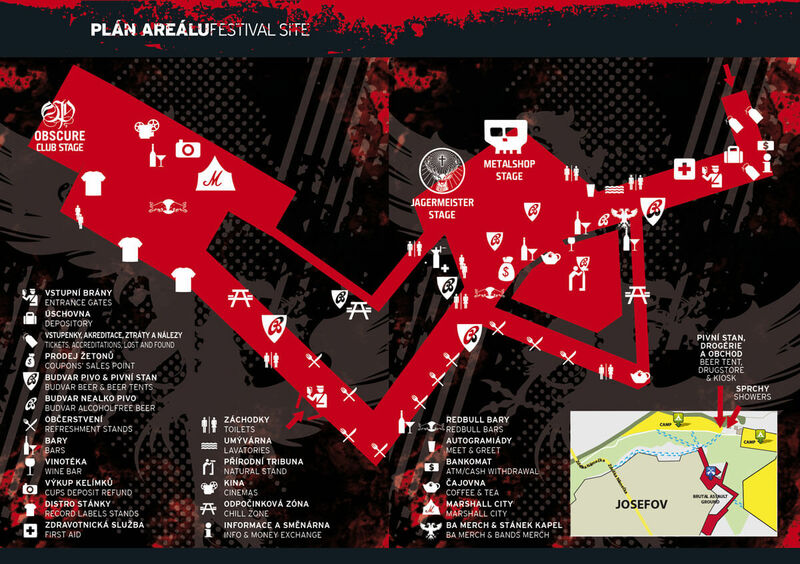 On these boards, you can accept the camping- sites, festival area maps, opening hours and running order. The boards will also give you an overview over different street signs you should look out for (e.g. camping ground etc.). The Information point is located at the new event area near the medieval market near the ribbon container. You can make phone calls there, get information about the shuttle- service or the timetables for trains, or take a look at the current running order, as well as times for the signing sessions, at the Meet & Greet point. This, as previously mentioned, is in addition to the one at the Siloturm in Wacken. 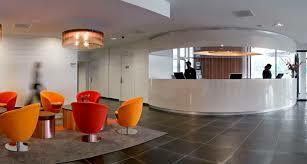 You can get at the Information checkpoint and at the W:O:A office. The Post office is located in the Edeka- Markt in Wacken in the business park. The locker trucks are now arranged on the new event area near the medieval market. We will install phones on the festival forecourt next to the police camp. Furthermore we have telephones at the Wacken office, so you can call your friends and family at home. One phone box is located directly in Wacken. All lost and confiscated property will be put in storage in the lost property office in Schenefeld (Fundbüro Amt Schenefeld). Lost property office, if you lose or find something, please contact the information checkpoint during the festival. After the festival, you can hand things in at the W:O:A Office or pick them up there. Property, which you didn’t pick up will be given to the lost property office in Schenefeld (Fundbüro Amt Schenefeld). In contrast to the last years, in 2009 we won’t have a certain ground for disabled , which is defined well in advance. This happens because of the experiences, we had to make in the past. Over and over again, people, who do not belong to this audience, crowded these defined areas. In this programme, you can find all the important information about bands, who performs when on which stage, ground maps, surveys, Meet & Greet schedule, Warm up & after Show Parties among others. The service charge of 1€ finances WET-Stage (Wacken-Evolution-Tent). The programme is available at different checkpoints on the festival area. We don’t want any kind of violence at the W:O:A! In case of damage at the fencing, the marquees and tents, or any other equipment of the organizer or other institutions, which support the festival, the person(s) in charge will be send off the festival and camping ground and a criminal prosecution will occur. We want a wicked, peaceful Metal week, just like the years before! The Full Metal Bag should be seen as a present and does not deal with the service due of 20,00€, which is already contained in the ticket price.